You can use Silverlight brush objects to paint with solid colors, linear gradients, radial gradients, and images. One of the most common operations in any platform is to paint an area with a solid color. To accomplish this task, Silverlight provides the SolidColorBrush class. The following sections describe the different ways to paint with a SolidColorBrush. Select a predefined SolidColorBrush by name. For example, you can set the Fill of a Rectangle to "Red" or "MediumBlue". The example uses the name of a predefined SolidColorBrush to set the Fill of a Rectangle. Choose a color from the 32-bit color palette by specifying the amounts of red, green, and blue to combine into a single solid color. The format for specifying a color from the 32-bit palette is #rrggbb, where rr is a two-digit hexadecimal number that specifies the relative amount of red, gg specifies the amount of green, and bb specifies the amount of blue. Additionally, the color can be specified as #aarrggbb, where aa specifies the alpha value, or transparency, of the color. This approach enables you to create colors that are partially transparent. In the following example, the Fill of a Rectangle is set to fully opaque red using hexadecimal notation. Use property element syntax to describe a SolidColorBrush. This syntax is more verbose but enables you to specify additional settings, such as the brush's opacity. In the following example, the Fill properties of two Rectangle elements are set to fully opaque red. The first brush's color is described using a predefined color name. The second brush's color is described using hexadecimal notation. A gradient brush paints an area with multiple colors that blend into each other along an axis. You can use them to create impressions of light and shadow, giving your UI elements a three-dimensional feel. You can also use them to simulate glass, chrome, water, and other smooth surfaces. Silverlight provides two types of gradient brushes: LinearGradientBrush and RadialGradientBrush. A LinearGradientBrush paints an area with a gradient that is defined along a line, the gradient axis. 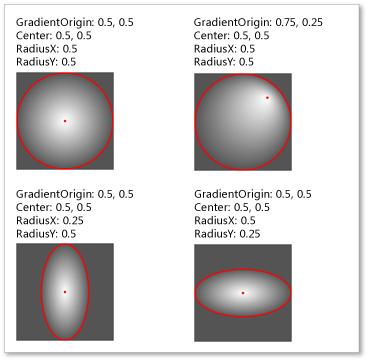 You specify the gradient's colors and their location along the gradient axis using GradientStop objects. You can also modify the gradient axis, which enables you to create horizontal and vertical gradients and reverse the gradient direction. The gradient axis is described in the next section. By default, a diagonal gradient is created. The following example creates a linear gradient with four colors and uses it to paint a Rectangle. The following illustration shows the resulting gradient. 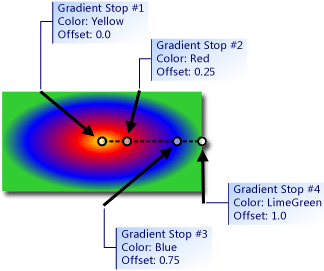 The gradient stop's Color property specifies the color of the gradient stop. You may set the color by using a predefined color or by specifying ScRGB or hexadecimal ARGB values. The color of each point between gradient stops is linearly interpolated as a combination of the color specified by the two bounding gradient stops. 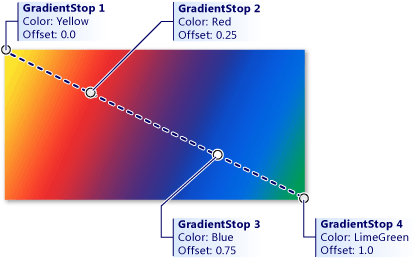 The following illustration highlights the gradient stops in the previous example. The circles mark the position of gradient stops, and a dashed line shows the gradient axis. The following illustration shows the resulting gradient. The gradient axis is marked with a dashed line, and the gradient stops are marked with circles. Like a LinearGradientBrush, a RadialGradientBrush paints an area with colors that blend together along an axis. The previous examples showed how a linear gradient brush's axis is a straight line. A radial gradient brush's axis is defined by a circle; its colors radiate outward from its origin. The following illustration shows the gradient created in the previous example. The brush's gradient stops have been highlighted. Notice that even though the results are different, the gradient stops in this example are identical to the gradient stops in the previous linear gradient brush examples. Because gradient stops do not provide an opacity property, you must specify the alpha channel of colors by using ARGB hexadecimal notation or ScRGB notation to create gradient stops that are transparent or partially transparent. The following sections explain how to create partially transparent gradient stops in XAML and code. The aa in the previous line represents a two-digit hexadecimal value that is used to specify the opacity of the color. The rr, gg, and bb represent two-digit hexadecimal values that specify the amount of red, green, and blue in the color. Each hexadecimal digit may have a value from 0 to 9 or A to F. 0 is the smallest value, and F is the largest value. An alpha value of 00 specifies a color that is completely transparent, and an alpha value of FF creates a color that is fully opaque. In the following example, hexadecimal ARGB notation is used to specify two colors. The first is partially transparent (it has an alpha value of x20), while the second is completely opaque. The ImageBrush class enables you to use images as fills, backgrounds, and outlines. An ImageBrush paints an area with a JPEG or PNG image specified by its ImageSource property. You set the ImageSource property with the path of the image to load. By default, an ImageBrush stretches its image to completely fill the area being painted, possibly distorting the image if the painted area has a different aspect ratio than the image. You can change this behavior by changing the Stretch property from its default value of Fill to None, Uniform, or UniformToFill. The following example uses an ImageBrush to paint the Background of a Canvas. The VideoBrush class enables you to paint an area with video. The following example uses a VideoBrush to paint the Foreground of a TextBlock. For more information about using a VideoBrush, see VideoBrush Overview.